What do readers think of the book? "Anne's diary gives a tantalising sketch of a happy outgoing person who documented her incredibly hard physical work with a saint-like lightness of touch. ..Her artisitic nature is revealed in her desciptions of nature... What a vanished world to record. Though still recent in historical terms, it represents a bygone age, and Anne's diary is a treasure as it tells it just as it was." "Reading the book "The Milk Lady at New Park Farm" is like discovering some long forgotten memories of life during the Second World War. Even if you are too young to have those memories in the first place, you are vivdly transported, through the reading of this honest account of British rural life against the backdrop of war." ".....it reaches a wider audience: those who are interested in the land girls and in the Second World War; those who are interested in farming; animal lovers; and those who simply enjoy a “feel good” story." "What a delightful read it was! I enjoyed it from cover to cover. This book brings everything vividly to life with day-to-day accounts, Evelyn Dunbar illustrations and those glorious photographs. ... It's such a treat to read about women's contributions to the war effort, regardless of the country. Anne McEntegart expressed such a positive attitude towards life and seemed to derive the utmost enjoyment from it. ... This book deserves to be upon library shelves internationally for its documentation of war efforts made by the womenfolk of England, not to mention its entertainment value and the tourist interest it will undoubtedly invoke"
"I knew that The Milk Lady at New Park Farm was going to be a "good read" when, after a only few pages, I couldn't wait to read more. Anne McEntegart writes with gentle humour and charm about her two years working as a land girl (though not officially a land girl). It serves to remind us of the vital work that went on behind the scenes by those whose main aim was to serve the nation in the best way they could. Anne's obvious love of animals and the countryside is clear. As a light and thoroughly entertaining read I would highly recommend this delightful book." "Just finished the book. What a heartwarming experience! I could easily see it becoming as popular as "The Diary of an Edwardian Lady". " " A fascinating and very detailed insight into a working farm in the New Forest during World War Two. New Park Farm was one of many in the New Forest, as in other places, where the Women's Land Army were working. 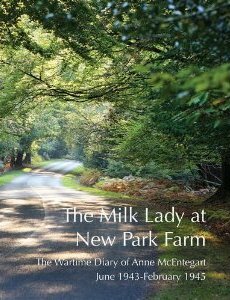 Although Anne wasn't officially a Land Army girl, her daily tasks were the same, but unlike probably any other farm in the New Forest, she kept a very detailed diary of her daily chores and events that happened on the farm. This gave a true picture of life on a farm as it was between 1943 - 1945. The reality was long hours in all winds and weathers and a culture of "make do and mend", unlike what is usually portrayed on televison or other writings. A fascinating and well written book." "This is a lovely, charming book that also provides a real insight into 1940's farming! It includes diagrams, photos, and the author's own artwork, as well as hand-written notes from the time. It is full of vivid, artistic descriptions of the writer's surroundings in the New Forest through the seasons, and introduces us to a range of appealing characters. The writer's straight-forward style is both evocative and humorous, while it's tale is engaging and heart warming. You cannot help to be charmed and inspired by this diary, and it's writer." "This is a delightful book which is not just an engaging read, but also an important reminder of the values which were espoused in 1940s England. Beautifully illustrated, this diary evokes a gentler, simpler era but equally shows the determination which the author embodied in the war effort. It is a lovely read and one which I found tremendously enjoyable. Highly recommended." "There are so many strands to this diary. First and foremost it's a feel-good story of the author's joy and enthusiasm in throwing herself into the hard work of old-fashioned farming and horse-drawn milk rounds, keen to support Britain's war effort. She thoroughly enjoys life alongside the Land Girls, farm hands, gypsies, and the soldiers assembling nearby for D-Day. It's full of entertaining tales - about wayward individuals amongst the ponies and cows, about Land Girls' love affairs, about rivalry between official and unofficial Land Girls. Also it gives a detailed, interesting picture of old countryside ways. And never far away is the war - the V1 air raids, breathless news of victories overseas, and friendly dealings with the Forces locally - British, Canadian and black GIs. Copious illustration includes period photos of the actual people and places in the story and a map which helps you follow the tale. Whether for a cover-to-cover read or just dipping into, this book's sheer variety will engage many people."